See this? This is not good. These are computer guts. Although I certainly marvel at the complexity of their anatomy and appreciate all they do, I can't say that I'm ever happy to see them. I took a computer hardware class once. 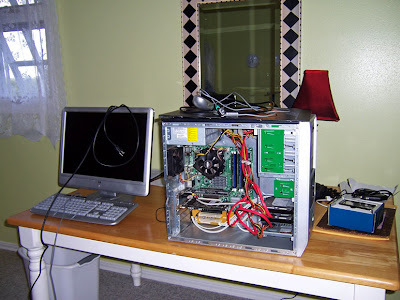 On the first day, the teacher handed us a screwdriver and told us to take one of his computers completely apart. I actually zipped through that day, de-gutting mine in record time, as unscrewing things is a lot like seam ripping. Believe me, I know my way around a seam ripper and I am FAST. On the second day, he told us to put his computer back together. I guess I should have expected this, but I sincerely thought he was going to TEACH us something in between the taking apart and putting back together. He obviously was under the mistaken impression that I had paid attention when I had taken it apart, and somehow remembered where all those pieces went. Well, this was the part that wasn't a bit like seam ripping at all. When you rip out something, you don't care how it WAS (since it was wrong), you want to put it back differently, hopefully better than it was. After several grueling hours, I did finish this nearly impossible task. And I do have to say that to my credit, mine looked a whole lot better inside than when I took it apart! All my wires were bundled neatly and my screws were aligned much more tidily. All the dusty parts got a good cleaning, and the ports got de-fuzzed. The CD drive had been a little bit crooked in its bay, but now it was held tight in perfect position, aligned at a perfect 90 degrees with the side seam of the processor. Of course, the computer didn't work any more after that. The Grim Computer Reaper had appeared sometime during my trial and condemned my patient to the eternal ethernet with his mighty Blue Screen of Death. Not even the teacher could figure out what was wrong, which actually was a little bit comforting to me. Not because it may have been a mechanical problem beyond both our expertise...but because I had wreaked some sort of vengeance for his torture of me. I could only hope he spent as many anguished hours fixing it as I had un-fixing it. So why this topic today? Well...I couldn't stand to talk about it before now, but my beloved computer's guts were a part of my post-vacation/real life re-entry process. The first time I turned my computer on after arriving home, she crashed spectacularly--with noise and lights and fizzle and pfffffts!, no less. I opened her up, and I saw the problem immediately: me. I love computers--but I'm more like a benvolent computer zookeeper than a computer neurosurgeon. Courtesy of Costco, I now have a new HP PC with a 25" monitor!!! I love it. Windows 7, 750 GB hard drive, 8 GB RAM and a 2 Quad Processor! I'm so jealous! I'm expecting the pffft! spark/pfffft! thing to happen here any day now. Somehow, my ancient desk top just keeps beeping and booping when I fully expect the Blue Screen of Death to appear. I hope the new 'puter means we'll hear from you a tad bit more often...hint hint. I love how you can take any topic (no matter how serious it has the potential to be) and make me LAUGH when reading about it!!! I'm glad you got a happy hunk after your old gal died a fiery death. May you and your new hunky HP live happily ever after! Hi Lisa, You are really great! I´m miserable with all kind of machines ( not with those in kitchen!). Congrats to your new HP! Excuse, I badly write in English. It probably because I russian, also live in Russia. I am work with computers. Long time. Very, very long time. I return it to life, and repair. I have many practical cases with users. Ridiculous and not the ridiculous. People animate computers. People provide it character traits, give it names. Grow up before it cactuses (ha-ha!). Today I have found the interesting and surprising fact. The countries different, the languages different, but people equal. Especially women! One to one. And it, probably, well. Oh, womens! They are capable to destroy what not probably to destroy, and to confuse the most simple things. And it is absolutely not important under what stars they were born, and in what language they think. Think they absolutely equally! Yes, yes! I seldom read blogs. And here I have got casually. Has read and laughed, laughed to tears. Thanks you. And good luck in your hard undertaking. Lightning Storm on its Way!